I look forward to receiving your posts in my inbox! Love this! Sometimes I get overwhelmed by all the things I could know but will never have the time to learn! Reblogged this on Poorly Thought Out Thoughts. This week, part of me wants to draw this in reverse with religious leaders sitting by the pile saying “wrong things we know are true by faith”, then the pile saying “things that are probably true but we think are wrong” and the biggest pile saying “things we dont know and for that reason we shouldn’t know”. But this does not fit with the air of cheerfulness and optimism that makes your drawings so charming. Thanks for the smiles. I might add that your cartoon is very insightful. The scientific revolution has been described as the discovery of ignorance, a concept previously unrecognised. This one might be my favorite of yours! My favorite. 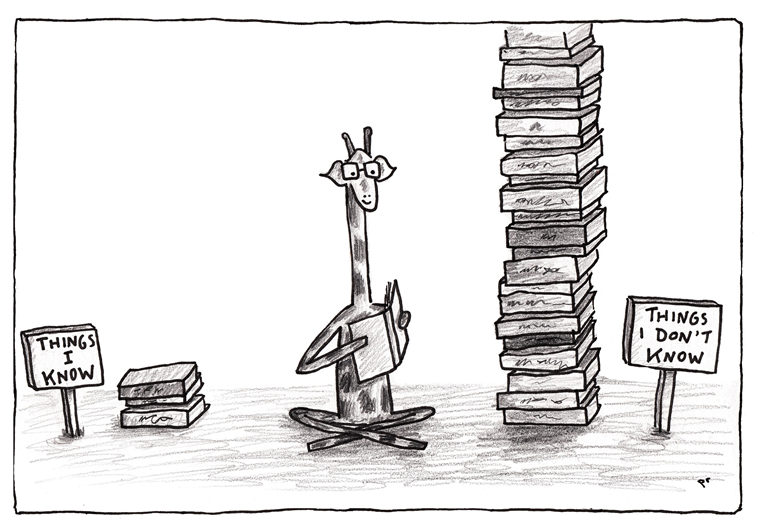 Even so, worried about Motivating Giraffe’s earthquake safety awareness. Please consider providing him some secured shelves so that his proud neck may fly forever straight.